There is significant untapped potential in Europe to optimise existing therapies and value added medicines represent an opportunity for patients, healthcare providers, payers, industry and the healthcare systems in general. 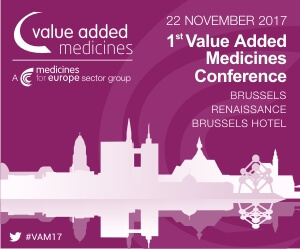 Come and join us for the first Value Added Medicines Conference in Brussels to learn more about value added medicines and to discuss the current environment, challenges and opportunities in Europe. Incremental innovation on known molecules – Necessity to address all patient needs? The target audience is policy makers, industry, academics and other stakeholders involved. The discussion will be on repurposing medicines. More information and link to registration can be found here .